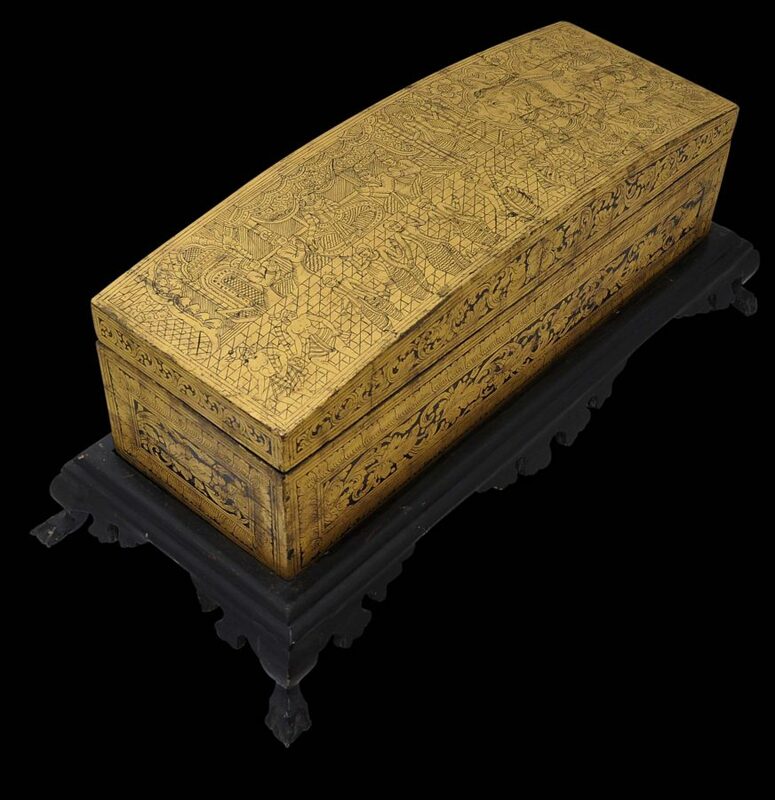 This manuscript chest or sadaik is decorated in gold leaf and black lacquer, a technique known as shwei-zawa. It is rectangular but has a cover with a broad curved top. The box sits on a separate, black lacquered stand which has four, flared legs and scalloped aprons. 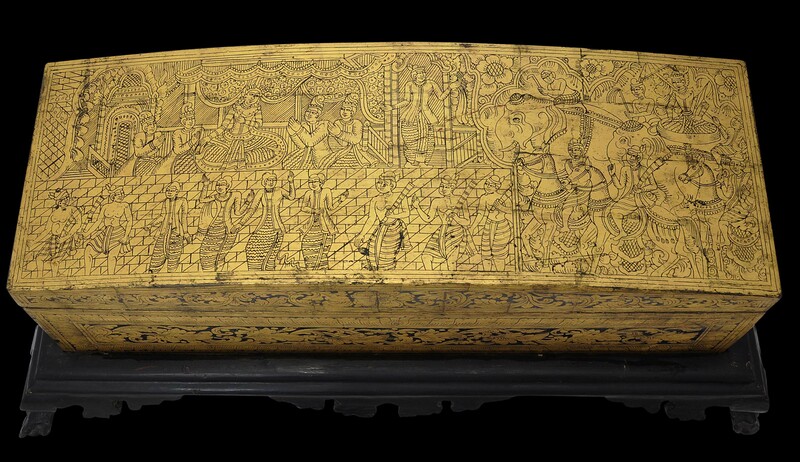 The top of the sadaik is decorated with a courtly scene, including dances and elephants. 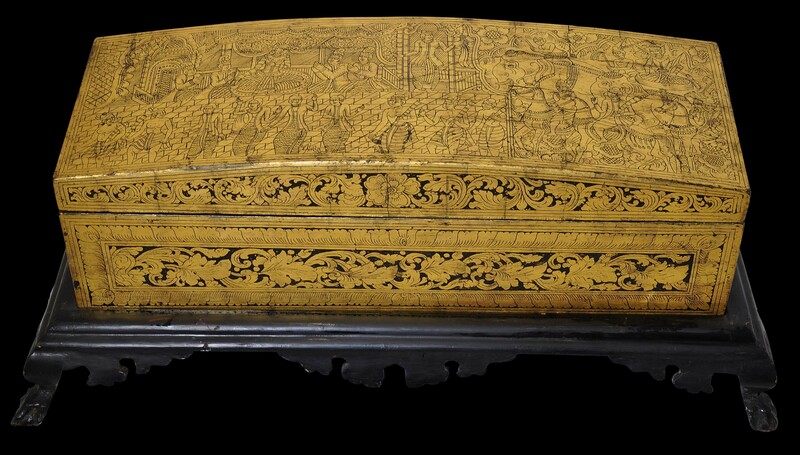 The sides are decorated with meandering floral and foliate scrolls within petal borers. Fraser-Lu (2000, p. 136) illustrates the top of a sadaik which has some similarities to the top on the example here. 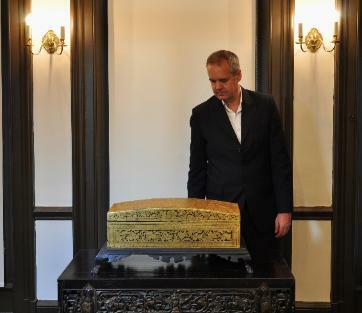 She attributed the box to the late 19th or early 20th century and possibly to Hsaya Hpa or Prome, near Rangoon. The interior is decorated in orange-red monochrome. Importantly, it retains its shallow internal tray. 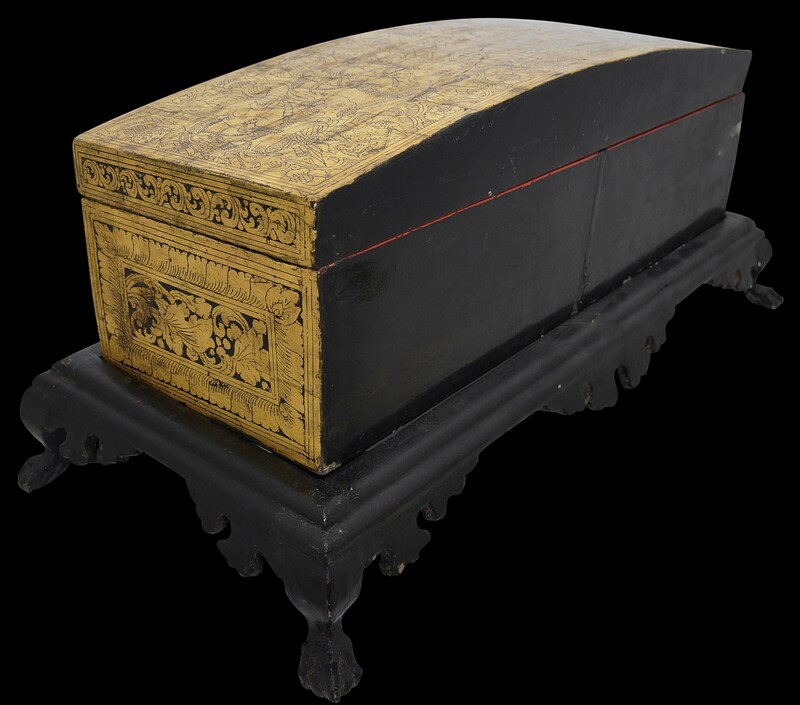 Such chests were used in monasteries to store precious religious manuscripts away from the harm of mice and water. This example was designed to hold a single kammavaca text. Sadaiks were commissioned to be donated to monasteries or were used in the households of important officials and the wealthy. The presence of the stand is important – usually the stands are lost. Overall, the box and stand is highly decorative. The condition is fine. There is the usual and expected rubbing to the lacquer work and some chipping to the black lacquered surface of the stand, but overall, the sadaik and stand are intact and free of repairs. Fraser-Lu, S., ‘Sadaik: Burmese manuscript chests’, in Arts of Asia, May-June 1984. 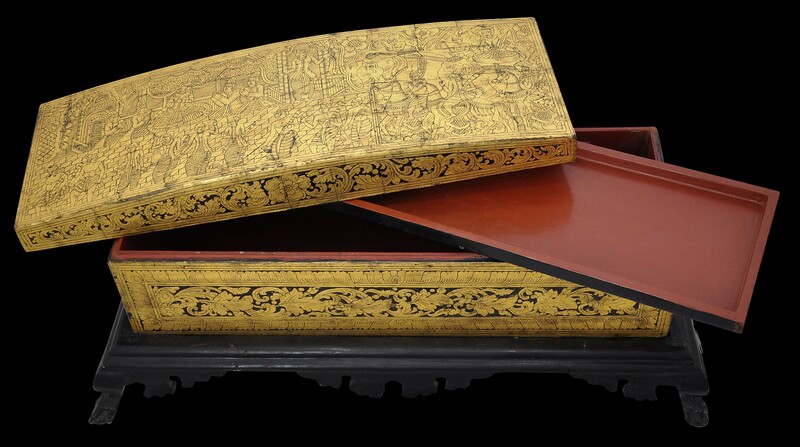 Fraser-Lu, S., Burmese Lacquerware, White Orchid Books, 2000. Isaacs, R., & T.R. Blurton, Burma and the Art of Lacquer, River Books, 2000. Than Htun (Dedaye), Lacquerware Journeys: The Untold Story of Burmese Lacquer, River Books, 2013.